It wasn't a conscious decision, but at some point my mind decided that I wasn't going to make block four of Down in the Garden this month. 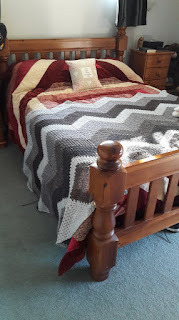 Instead I have been hooking away on the big blanket. So not really a month off at all! I spent all day yesterday curled up under it and plan to make some time for more of the same today. But first I need to go buy some more yarn. With ANZAC Day just around the corner, poppy sellers will be out in NZ today. Time to show off this beauty again. I've always loved poppies and couldn't resist making this one last year. .
Claire and Debbie bought me a kit at a sale they attended. Love those girls. Once again very little crafting took place in my house on Sunday. As has become habit I started the day in the kitchen. I made chicken soup with left overs from Saturday evening. While that was bubbling away I also made two rather large fish pies. As I always work until 8 pm on a Friday evening, it is up to Tony to cook our Fishy Friday meal. While he makes a great pan fried fish and oven chips, I do like to vary things a little. He has tried out a couple of recipes successfully but didn't want to try my fish pie recipe. There are now two resting in the freezer awaiting their turn, all I have to do is defrost them, all he has to do is reheat them. Yum. Once I was done there and the menfolks war games had come to a conclusion, we headed out into the garden. We had our first frost yesterday! It's very early this year. By the time we went out there things had warmed up beautifully and we set to work, clearing out four of the veg beds, the only thing left in one corner of one is some spring onions. I may have to pull and freeze them, I'll see how they go. In the long bed alongside the house the beans are still producing a good handful every day, the butternut squash has not done so well, with six ripe fruit and three still green on the vine, I've been researching what to do about that and was happy to find I could bring them indoors and ripen them in a sunny room. A job for this morning, or maybe tomorrow, perhaps next week we will finish clearing that bed out and mulch the garden for the winter months. After lunch things slowed down a little. We went out to collect a book case I won in an online auction. I tucked it in under the kitchen bar and filled it with recipe books. I had books in the kitchen, books in the hall cupboard and books in the big book case in the hall too. Now they are all together, and I have room for more! There was one more job to do before we sat down for a rest. 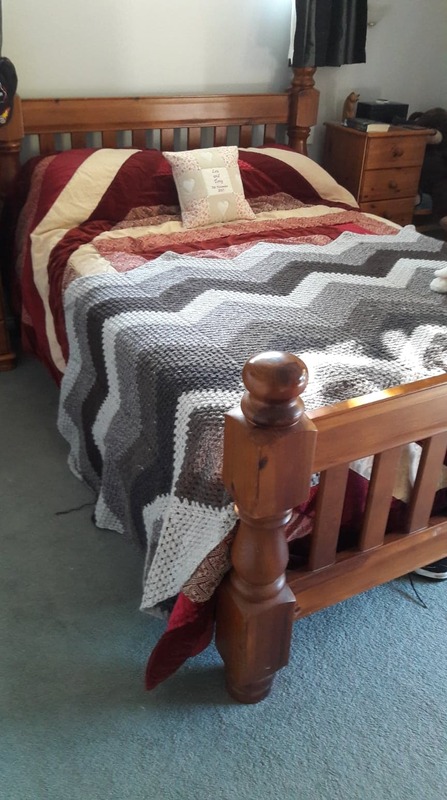 I spread my latest crochet blanket out over our bed so that I could see how much progress I've made and get an idea of how much more yarn I might need. I think I'm about half way there. Of course it grew a little after this picture was taken. I'll be off to the shop tomorrow for more yarn. Of course with the end of this one on the horizon, I have been planning another crochet project, something not quite so huge. I've been a reader of Lucy at Attic 24 for a while now and have recently spent quite a bit of time browsing her many patterns and tutorials. I'm fairly certain my next project will be one of hers, but there are so many to choose from and so many different colour combinations too. No progress has been made on Spring Queen or block 4 of Down in the Garden, maybe on my days off. I first introduced her to you back in August of 2014. I promised not to bore you with her as she is a large piece. A few days later I showed the very first progress shot. Then I must have kept my promise as I have only about 18 progress images in my records here on the PC, but she wasn't completed until 25th January 2016. On Wednesday, after hanging in the cupboard for three years, I finally mounted her onto an acid free canvas. I added a trim of pretty flesh pink tape that looks sew much better in real life than it does here. and now she is hanging on the wall in our hall way, in a position of Tonys choosing! I was going for the bedroom, well, she is asleep, but Tony insisted on the hall. So here is in, slumbering in her bower. Flash photography, sorry it's rather overcast and dark today. At 19 x 17 inches she is the largest piece I have ever cross stitched. Would I do it again? Probably. Small pieces are fun and, as you know I've stitched plenty of them, but I love a challenge. Speaking of larger projects, I have an hour before I have to think about getting ready for work, so I'm off to play with my latest stitchy challenge. Spring Queen here I come. She is progressing v.e.r.y. slowly.